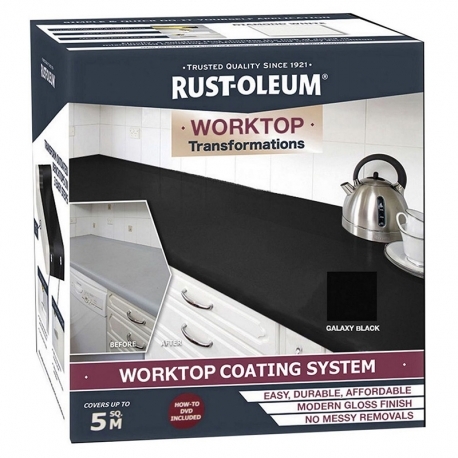 The Worktop Transformation Kit from Rust-Oleum, is a revolutionary do-it-yourself coating that enables you to easily and affordably transform your worn or damaged worktops. 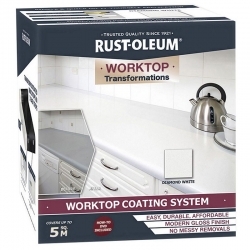 Rust-Oleum Worktop Transformation Kit is a revolutionary do-it-yourself coating that enables you to easily and affordably transform your worn or damaged worktops. With Rust-Oleum’s Worktop Tranformation kit, in just one weekend, you can have beautifully restored worktops that will last for years to come. This product works well in conjunction with hygienic wall-paints for restaurants and bars. Watch the instructional video above for guidance before using the kit and always refer to the instructional leaflet included in the pack. The kit is easy to use and no special skills are required! In fact, you won’t even have to remove your worktops. Choose from Galaxy Black or Diamond White for a fantastic finish with subtle sparkle. Basecoat: Recoat basecoat after 2 hours. Topcoat: allow to dry 48 hours for light use, 7 days for full use. Coats required: Basecoat: 2 coats. Topcoat: 1 coat. The flecks help to hide imperfections in the substrate. Can I use this product on wooden worktops that have been coated in Junkers Rustic Oil over the years (all dried of course) but quite glossy? Rust-Oleum Worktop Transformation Kit would not be suitable for application to this type of surface. 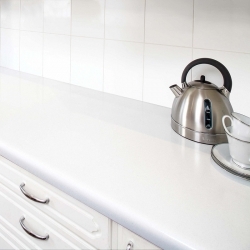 Earthstone worktops appear to have an acrylic top layer, provided this has no wax or water repelling properties then the Rust-Oleum Worktop Transformation Kit can be applied. 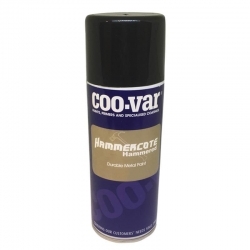 The abrasive pads can be used on this type of surface to provide the key for the colour base coat. Can I use my own glitter to mix in to the topcoat? The Rust-Oleum Worktop Transformation Kits (Black & White) both have glitter particles in the lacquer formulation. If you would like more of a glitter effect then you could put more glitter either stirred into the lacquer finish or sprinkled on top while it is still wet. If sprinkling on top you would need to roller the particles into the lacquer to make sure it is completely covered. Any flakes which weren’t completely covered by the top lacquer could tarnish or react with cleaning products. Finally, if you do wish to introduce your own glitter we would recommend carrying out a test, before using the full kit. No, at the moment in the UK the only two colours available are Galaxy Black and Diamond White. We advise against this as when mixing colours you can get colour separation, the 2 pigments don’t mix together completely and streaks will form in the finish. Unfortunately we don't offer the components of the pack separately. The coating is heat resistant, for example, it will take hot cups of tea on the surface, i.e. up to 100°C MAX but not a pan from the stove or casserole dish out of the oven for example. 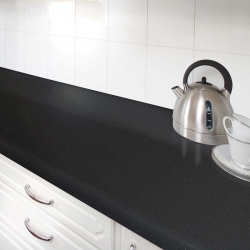 Would the black cover oatmeal coloured worktops ? 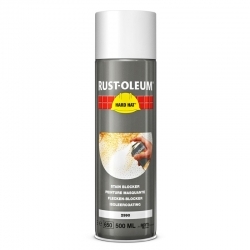 When applying Rust-Oleum Worktop Transformation Kit over a significantly different base colour you may not get good coverage and additional coats of the desired finished colour may be required. Prepare the surface following the instructions included in the Worktop Transformation Kit in white. 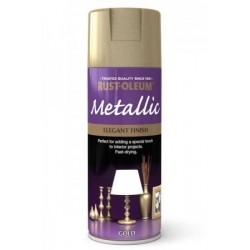 Apply 1-2 coats of the Rust-Oleum Satin Finish Furniture Paint in colour of your choice, to achieve complete coverage over the substrate. Finish off with the Kitchen Worktop lacquer. 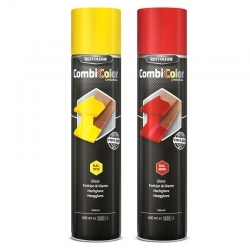 You would not get good coverage with the white supplied with the kit over a black worktop, additional coats of a white paint will be required. Apply the White Base coat. Apply 1-2 coats of the Rust-Oleum Satin Finish Furniture Paint in Cotton (white), to achieve complete coverage over the black substrate. Question: Can I add glitter flakes or sprinkle them on work top to add to the work top? Question: Hi, would the white cover a black worktop? No. Each kit is sufficient to coat 5m² of work surface, measure your area and ensure you purchase sufficient to apply 2 coats. Question: can worktop kit be tinted to make other colours , or mixed together to make grey? 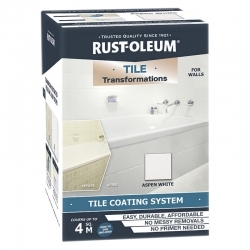 Rust-Oleum Tile Transformation Kit is a revolutionary do-it-yourself tile coating system that enables you to easily and affordably transform your tiles. 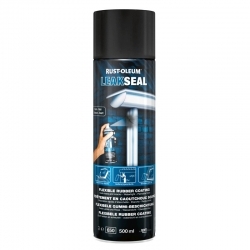 Rust-Oleum Tile Transformation Kit enables you to paint over old tiles without removing them and provides a ultra-durable finish that will last for years. 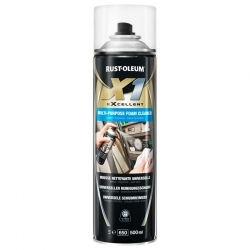 A high quality foam cleaner/degreaser from the Rust-Oleum product range which dries leaving no visible residue and is safe to use on most hard surfaces and fabrics. 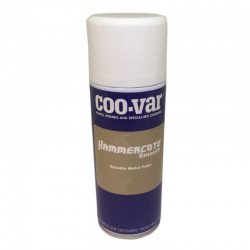 Great for priming interior surfaces and spot priming exterior surfaces. 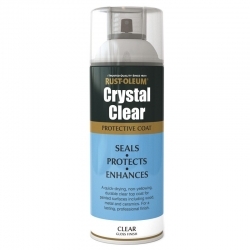 It is formulated to seal, prime and block out stains on previously painted or new work and dries in minutes.